Explode with colour with this years Rainbow Run! Explode with colour at this years Rainbow Run, Saturday April 20 at 12pm! It’s colourful, it’s fun and it’s back again this year at the Whyalla uneARTh Festival. We’re talking about the Rainbow Run, a colour-crazy event that is happening on Saturday, April 20. This will be the fourth Rainbow Run in Whyalla with over 3000 people attending the previous Rainbow Runs in total. The organisers of the run, the City of Whyalla Youth Advisory Committee (YAC) and Events to Activate, are expecting an even bigger crowd this year and have been busily packing bags of the non-toxic fun powder that make for this spectacular event. ​The Rainbow Run involves an open invitation for anyone to come along to walk, run, skip or dance around a 3km trail while getting covered from time to time at four “colour stations” with all sorts of coloured powder. The powder is completely safe it and it’s a completely crazy thing to do! Those participating are encouraged to wear white clothing to emphasise the colours they’re going to be displaying all over themselves. You’ll also need to wear good walking shoes, adults & children should wear sunglasses to keep their eyes free of powder. “This isn’t a race, there’s no winners, it’s just getting some colour on and having heaps of fun,” City of Whyalla Youth Development Officer and Rainbow Run organiser Gail Rostig said. …… could we put this in the story somewhere……..Gail would like to acknowledge Events to Activate & Eyre Gymnastics for their all their assistance with the Rainbow Run this year! 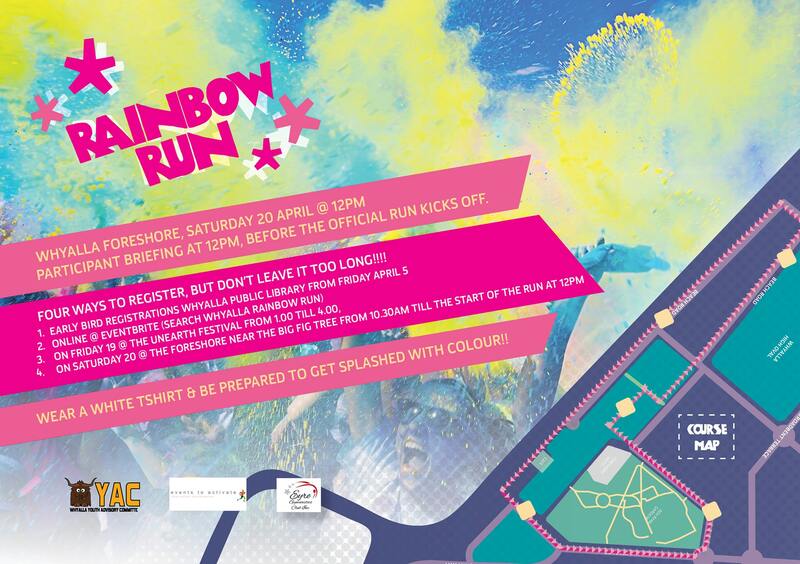 The Rainbow Run starts at 12pm from the foreshore near the big fig tree. You can register the day before at the uneARTh Festival between 1pm and 4pm, on the day between 10.30am and the start of the race or pre-register at the Whyalla Library or online at https://bit.ly/2Kljm2X and only a single cold coin donation per person is required. The Little Palais comes to the Whyalla uneARTh Festival 2019 a venue holding a completely free offering of circus and variety for all ages. The Whyalla uneARTh Festival 2019 this Easter weekend. Check in here for the latest news on this award-winning event. The 2019 Whyalla uneARTh Festival now has a face and an image … several actually. Exciting news as Festival Co-ordinator Cara Hume joins the Whyalla 2019 uneARTh Festival organising committee.